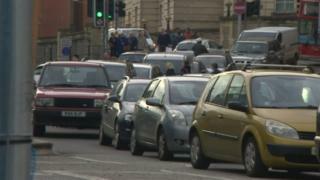 Bristol City Council has missed a second deadline for providing details of a clean air zone for the city. The plan was supposed to be written by the end of 2018 and the authority was given until 21 February to respond. In a letter sent to the environment minister on Thursday 21 February, elected mayor Marvin Rees said the date had "regrettably not been met". He said the delays were caused by concerns raised over proposals to introduce congestion charges. Mr Rees said many of the vehicles affected by the proposed charges would be some of the oldest diesel vehicles, possibly driven by those with less money to be able to afford the congestion charge. He felt this could adversely impact lower-income families, leading to more social inequality. On Wednesday, members of Bristol's Green Party said it wanted a congestion charge for non-residents driving into the city centre. But the ruling Labour Party said charging non-Bristol residents was illegal as councils could not consult them. However, the Greens insisted the proposal was legally possible. The Under Secretary of State for the Environment, Thérèse Coffey, had written to Mr Rees in January to say the city's lack of planning was "alarming" and she was "astonished" by the delay. In the letter to Ms Coffey on Thursday, that has been seen by the BBC, Mr Rees said: "The timeline for submitting our Outline Business Case (OBC) by 21 February has regrettably not been met and this is unavoidable." "Had you spoken with me or even communicated privately, you would have learned just how much we are actually doing and the complexities we are overcoming to work towards cleaner air for the citizens of this city," the letter from Mr Rees added.